El Copey is municipality in Cesar Department. It was founded on 8 November 1936 and became a municipality by ordinance 008 of 3 November 1971. 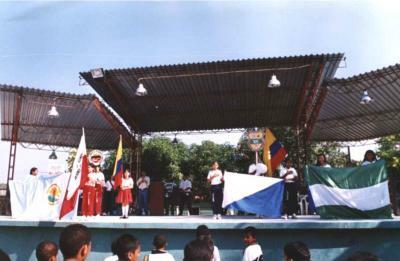 The flag of El Copey is 145 cm.X 215 cm.is size, horizontally divided green-white and charge with the municipal coat of arms. Wikipedia show it in plain version. "The dimensions of the flag are 2.15 m in length and 1.45 m in height, with the upper stripe (2.15 m x 0.73 m) white, representing the cotton grown in the region, and the lower stripe (2.15 m x 0. 73 m) dark green, representing the splendor and beauty of the Sierra Nevada de Santa Marta and the beautiful valley of river Ariguani." This description contradicts the image, with the colours swapped. However, a photograph of the flag at the municipal web site confirms that the written description is wrong. The photograph also shows, among others, a diagonally divided white-blue. The emblem is 68 cm in height and 52 cm in length, with a yellow border bearing in chief the writing "EL COPEY VILLA DEL CESAR". The chief of the shield is sky blue with three white stars representing the three "corregimientos" of Caracolicitos, Chimila and San Francisco de Asis. The median stripe of the shield is white, with, from left to right, a rice panicle, a coffee branch, a cotton boll and a cow, all in blackand white and symbolizing the municipal resources in agriculture and cattle breeding. The main field of the shield is green, diagonally divided by a blue stripe fimbriated in white, representing the river Ariguani, on its left a brown railway and on its right three black African palms.